After a long day in the office or a late night with friends, there’s nothing quite as comforting as your bed. But, if your current set of sheets are worn out and frail, then you’re out of luck — until now. Stay cool and cozy year-round without breaking the bank with the Bamboo Comfort 4-Piece Luxury Queen Sheet Set. This four-piece set gives you opulent comfort at a fair price. 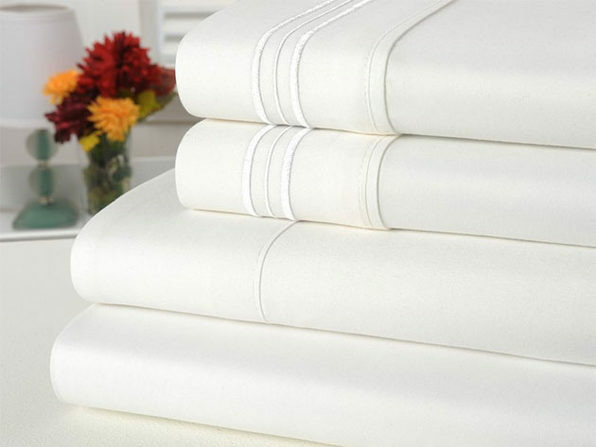 For starters, the sheets are made from a blend of high-quality microfiber and bamboo, with a total thread count of 1,800. Meaning, you’ll get a ridiculous amount of comfort when tucked underneath these guys, ensuring you sleep well at night by staying cozy during cold months and cool during the hot days of summer. What’s more, since they’re hypoallergenic, you’ll reduce the allergens hanging around your bed and keep yourself from sneezing or coughing throughout the night. Even better, these wrinkle-free sheets also make an excellent accessory for your bedroom. The sheets’ vibrant white color not only enhances the look of your room, but it also stays after repeated washings, making it a stylistic piece from day one. On top of that, you’ll get the perfect fit for your queen-sized bed — even if it’s an extra-thick mattress up to 16″ — thanks to the set’s deep pockets. Get the set for 63% off at $39.99 in The Daily Caller Shop.